Whatever your moving needs may be, our Lodi movers will help you feel at home. Our professionally-trained student-athlete Meathead Movers and our moving concierge will be with you for the entirety of your move. When thinking about moving, be sure to consider our Lodi movers to help you on your next move! Make it a smooth transition with Meathead Movers. Most people know the city of Lodi thanks to the song by Creedence Clearwater Revival. While this rock hit brought national attention to Lodi, there is much more to this eclectic city in central California. If you’re looking to settle down, Lodi is an excellent choice. Although Sonoma and Napa often get more attention, Lodi is well-respected for its wineries, especially with its Zinfandel wines. Its most famous winery is probably Woodbridge, which is highly influential in the American wine industry. Woodbridge is operated by Robert Mondavi, who grew up here. With over 62,000 residents, and there are plenty of opportunities for culture and commerce, especially in Hutchins Street Square, which hosts numerous events throughout the year. Check out the historic downtown for its fine dining, antique shops, and historic museums. Residents can also enjoy a nice and relaxing stroll along Lodi Lake. As the largest independent moving company in California, Meathead Movers is dedicated to providing you with the best service possible. The Meathead Difference starts by hiring quality employees. The vast majority of Meathead employees are student athletes, which means they are well-equipped to handle the physical demands of the job with a positive attitude. You will also notice that our Lodi movers strive to save you time and money by providing fast and efficient service. For proof, just watch as our employees jog to and from the truck when not carrying your items. 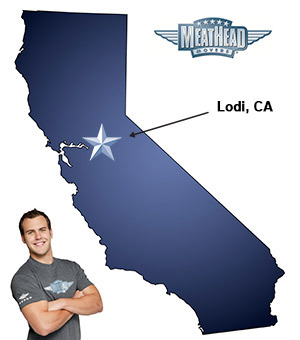 When you entrust your move to Meathead, you can rest assured knowing that your move will be a success because our professionally-trained student-athlete Lodi movers are the best movers the industry has to offer. With our 100% satisfaction guarantee, the only thing you have to lose is the stress that comes from moving! Contact us today for a free moving quote and to learn how we can help you move to your new home! Moving to Lodi? Here are some helpful resources. Customer Service could not have been any better! They made the moving experience so easy and helped eliminate most of the stress that comes along with moving. Jenny went above and beyond her duties. She answered every single question and was patient throughout the whole process since we weren't exactly sure when we needed to move. The crew that came was excellent! All of them were very polite and extremely hard working. They handled all of my furniture with care and finished faster than expected. They really do run, too! I am already telling everyone about my experience with Meathead and would recommend them without any hesitation. Great job! Thorough from the start to end!! It’s abreeze using you guys!! Very curtious, movers explained everything, worked fast and did a good job.